Deciding on the soup for Sunday we always consider what’s in season, and if there is anything to use from the Common Growth garden. This last Sunday 3 February, with mushrooms being in season all year round and in abundance at the local markets right now, and wild garlic ready to pick up at the church, we made a big steaming pot of mushroom soup and garnished with wild garlic. Garnishes to soup can make all the difference, adding an extra taste dimension. With wild garlic and a spoonful of creamy soft cheese yogurt, seasoned with pepper lemon and sherry, tis was delicious standing around in the damp winter garden, sharing soup after a bit of garden work. That’s the way it goes each Sunday now, from just before 2pm, the Common Growth gates open and people start to arrive. New-comers are warmly welcomed, you can sit and just enjoy the company and a bit of fresh air or like our new young visitor, who retuned this Sunday after visiting at Halloween, get stuck in to digging, before eating. Some of the members like to get a involved in a task first, they feel they want to earn their soup, so it’s an informal atmosphere, where there is something for everyone. 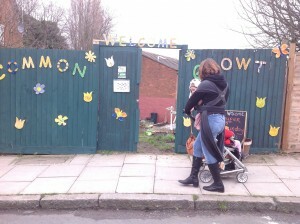 If you fancy coming along to Common Growth next Sunday, just turn up. You can take on as much responsibility or as little as you like. Common Growth does have a core members group that is always open to new members. Plans now afoot for the following year include, how to develop the use of the garden by building a deck, and creating a pond, planning what to propagate in the new greenhouse, increasing the yield of food produced and to teach and learn gardening skills. There was plenty of choice of tasks in the garden, both clean and dirty, to keep anyone who happened along, busy on Sunday afternoon. The greenhouse continued to be put together, it needed tiny screws fitted all over taking a good degree of patience, fine motor skills and good eyesight, but it is almost complete. 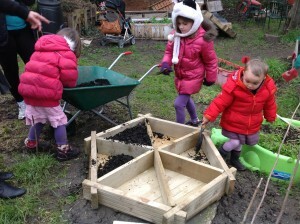 Filling the hexagonal planter with compost. Another, dirty task, was to complete the planter foundations, making a level base, we used bits of broken brick and the sticky clay soil found on site, to create a rockery type finish to both hexagonal planters. 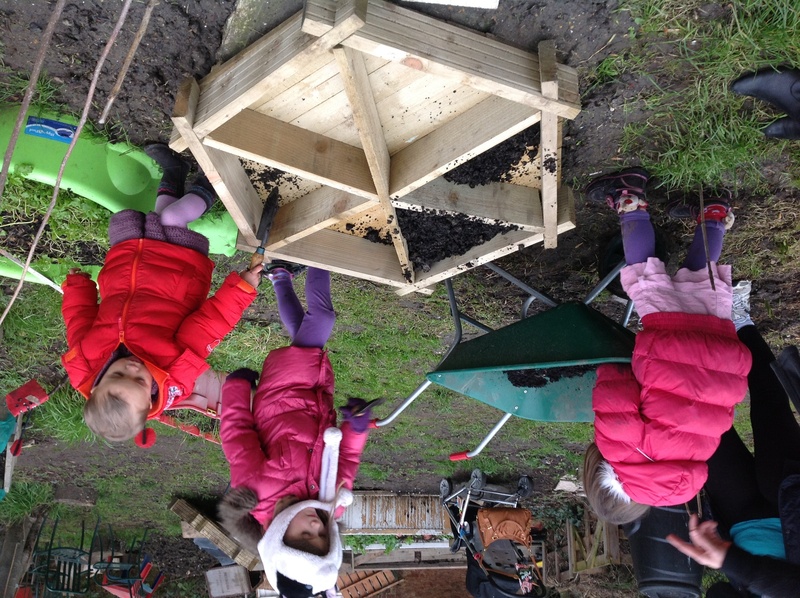 Lots of muddy soil needed moving, using trowels and the wheel barrow. Jobs are found for every age, come rain or shine, it is a lovely way to spend time with children, where they are learning all the time about cultivation. 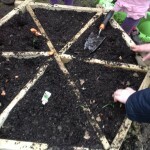 During this task, there was lots to discuss about worms and how they help make the soil good for plant growing. Various flower bulbs planted. Which way up does the pointy bit go? 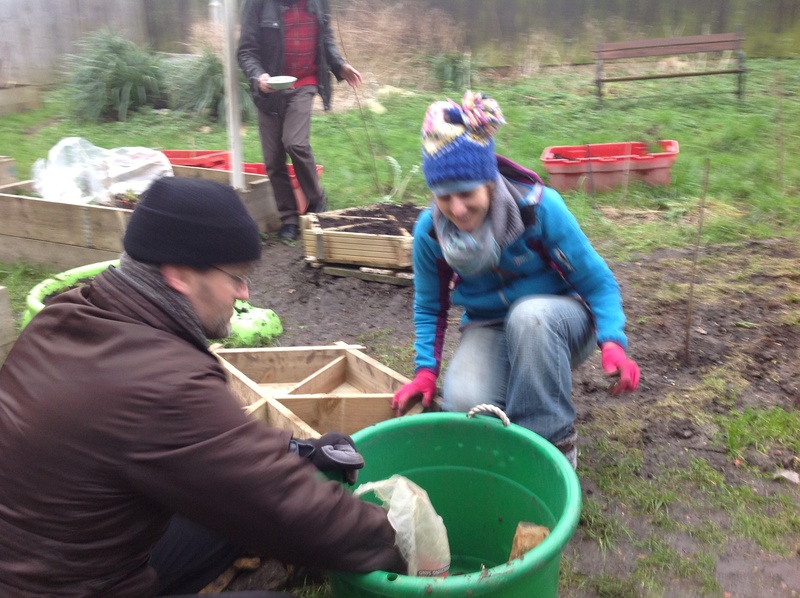 Using the barrow was a lot of fun to shift compost to fill the new hexagonal planters There was a great sense of energy sharing the barrow task, which involved many journies to the compost and back to fill the planter right up to the top. 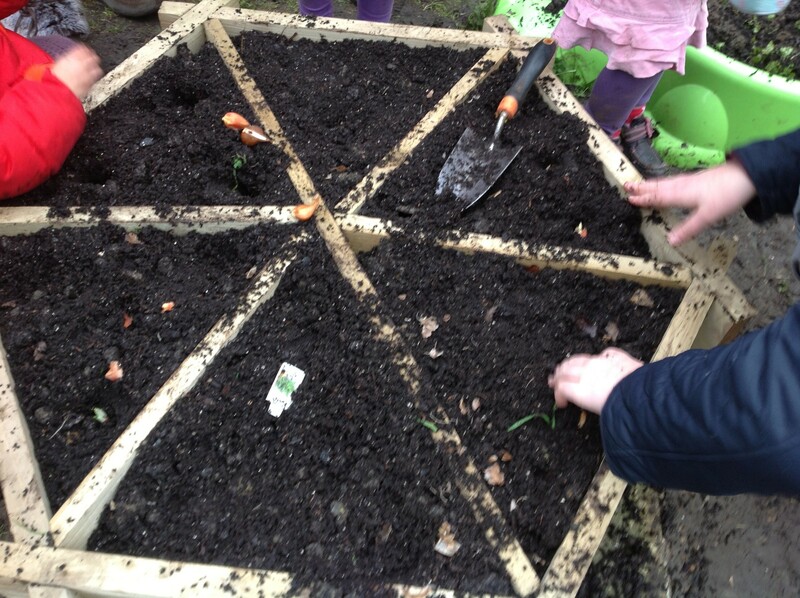 Then a demonstration on how to plant a selection of flower bulbs. We wondered how long til they start to shoot green points up towards the light It was time for a little winter harvesting too, up came an abundance of Jerusalem Artichokes which were distributed to members who wanted some. Common Growth is open every Sunday afternoon from 2pm to dusk, hot soup and bread provided for all, various tasks to suit all ability, everyone is welcome. Grow Wild took some artichokes from Common Growth, to replant some at the Cloister Garden for a new crop next winter. Some will be used too, to make the soup for next weekend’s Grow Wild event on Saturday. Combine equal amounts of thick natural yoghurt and cream cheese, i used 3 table spoons, mix together, then squeeze in half a lemon, add, a spoon of olive oil, as much ground black pepper as you like and a pinch of salt (a splash of sherry can be welcome too) mix together well – swirl this into the centre of your bowl of soup. For those who prefer no dairy – combine equal amounts of olive oil and lemon juice , copius amounts of black pepper and a pinch of salt – drizzle this into the centre of your bowl of soup! 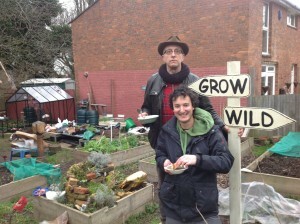 Grow Wild will eventually have a recipes page, if you have any contributions or comments please contact one of the Grow Wild team.